There's a reason Matt Drudge just got done celebrating an all-time record August traffic count. His visitors know that he constantly links to newsworthy stories they likely won't find reported prominently in establishment U.S. media outlets, if they're reported at all. Such will likely be the case with a blockbuster story coming out of Great Britain tonight, courtesy of the U.K. Telegraph. It seems that there's this treatment protocol called the "Liverpool Care Pathway." Under the Pathway's guidelines, according to the Telegraph, "Under the guidelines the decision to diagnose that a patient is close to death is made by the entire medical team treating them, including a senior doctor." Why, if I didn't know any better, that sounds like a d-d-d-d-death panel, complete with top-down ("senior doctor") supervision. “As a result a national wave of discontent is building up, as family and friends witness the denial of fluids and food to patients." .... (Dr. Hargreaves) added that some patients were being “wrongly” put on the pathway, which created a “self-fulfilling prophecy” that they would die. ..... “It is supposed to let people die with dignity but it can become a self-fulfilling prophecy. 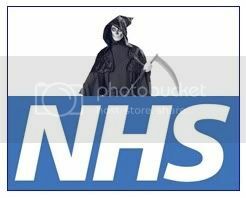 Based on the above 16.5% statistic, about 95,000 of the UK's 574,700 deaths in 2007 "came after continuous deep sedation." If the UK's death rate after continuous deep sedation would have replicated Belgium and the Netherlands, about 47,000 fewer would have died under those circumstances. How many of them should still be alive today? The suggestion that the number is in the thousands, if not the tens of thousands, would appear to be not at all unreasonable. So whaddaya think, New York Times, Washington Post, LA Times, Associated Press, and Big 3 networks? In the midst of an attempt to impose a statist health care system on this country, isn't the fact that one of the oldest statist health care systems in the world is more than likely systematically and prematurely offing thousands of patients a story? Or are you going to let Matt Drudge keep linking to the real news you ignore until you're no longing just circling the drain, but actually in it?